"Radio Telescope" is the 83rd Mandrake Sunday story. The story was written by Lee Falk and drawn by Phil Davis. Mandrake and Narda visiting an observatory to have a look at the great radio-telescope. While talking with the director a coded signal coming in from Siridanis. Siridanis, a star about eight light years away. 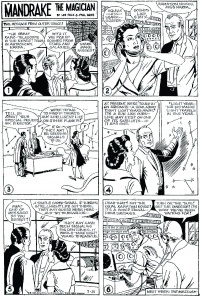 The story title is taken from the strip of July 24, 1960 (Next Week: Radio Telescope). A better title would be The Message from Outer Space, the intro in the strip of July 31, 1960. This page was last edited on 4 November 2018, at 19:01.